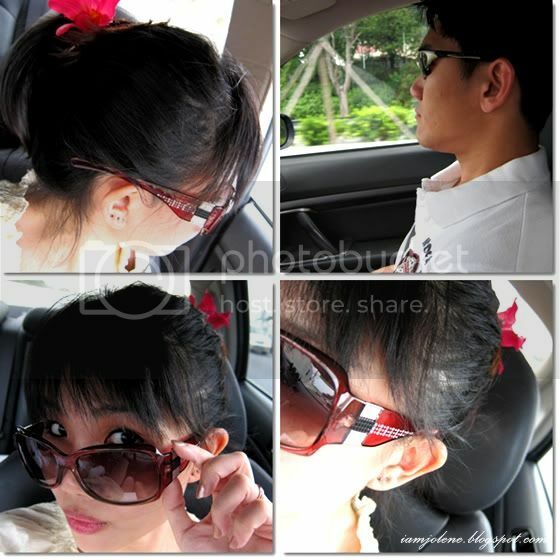 I have finally gotten the full set of photos and videos of some of our outings from cyn only a few days back. Hence, here I am back to updating backdated entries. 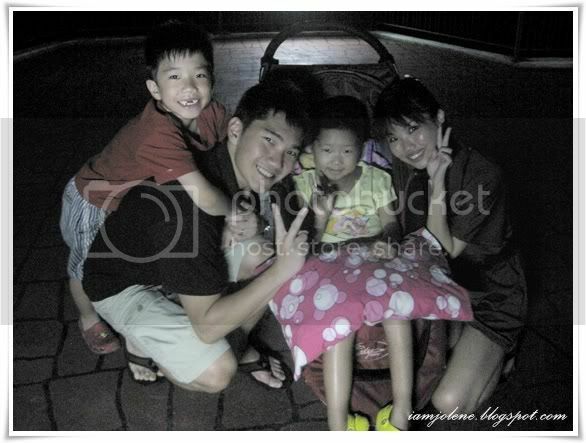 On the night of 14 July 2011 which was Charmaine's actual birthday, kh and I brought Cyn mommy and the kids to a very deserted place in Singapore to release their wishes into the sky. It was the first time the kids would be doing this and they did not quite know what to expect. 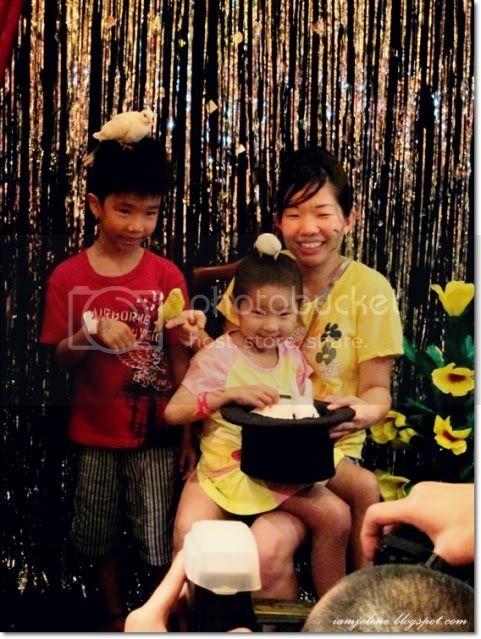 Charmaine was growing weaker by the week and I wanted her to experience a whole new way of making wishes which I was quite certain would bring her joy and hope. This place was really deserted and we only bumped into a lone group of people throughout our whole time there. The Chinese characters "许愿灯" up there translates to "wish lantern". 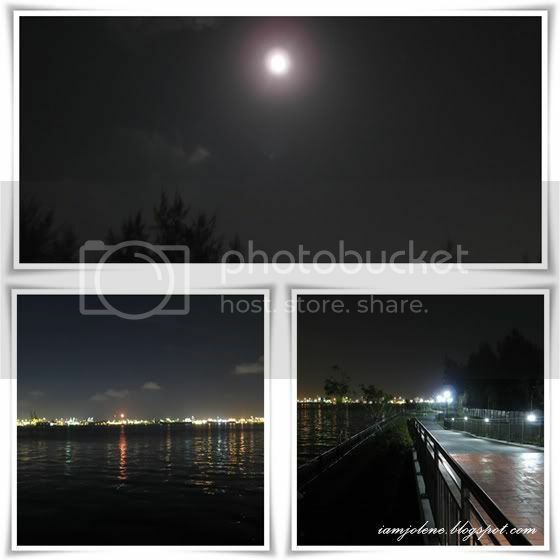 Such lanterns are also known as Sky Lanterns, Kongming Lanterns or Chinese Lanterns. We strolled along the brick path till we found the quietest and most spacious spot before setting down our "equipment" and got down to work. 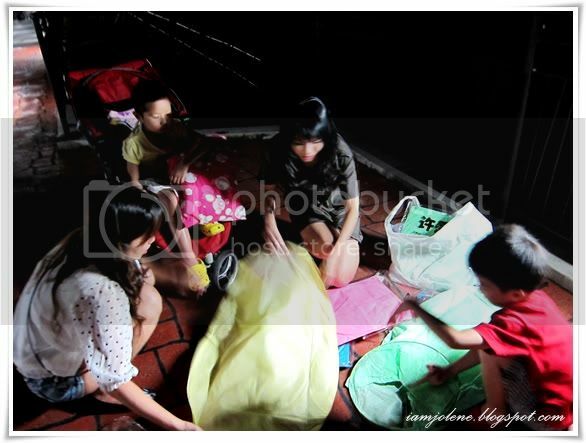 We had lanterns of the trio's favourite colours -- pink for Cyn Mommy, yellow for Charmaine and green for Jase. 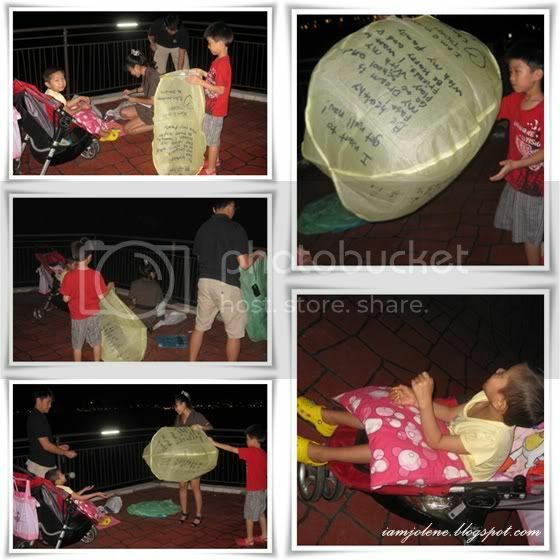 Soon the kids understood that they were to write their wishes on the lanterns and release them into the sky while wishing and hoping and praying that their wishes would come true. 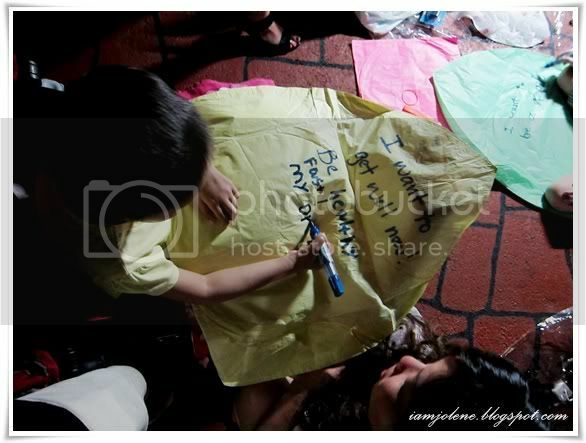 With Cyn Mommy's help, Charmaine quickly got down to writing all her wishes. Jase didn't quite know what to write and wrote his dreams about being a pilot. He started drawing and decorating after that. 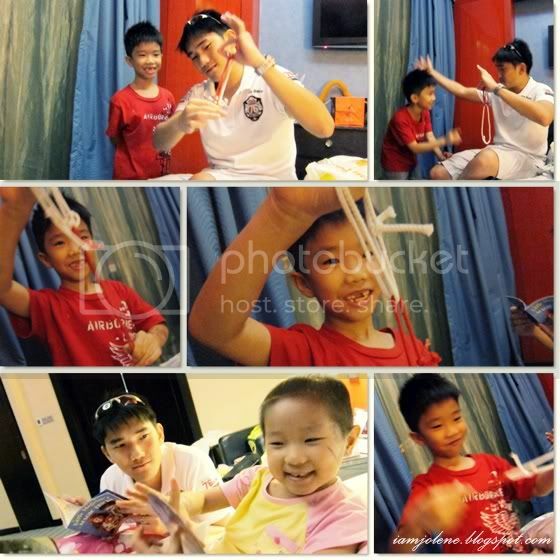 He even helped Charmaine with decorating her lantern. After that, Jase tried to make himself useful by running along the pathway and "catching" wind into the lantern. The yellow lantern could not float and we found that one part of the glued edge had opened when we tried to pry the lantern from the stuck edges. 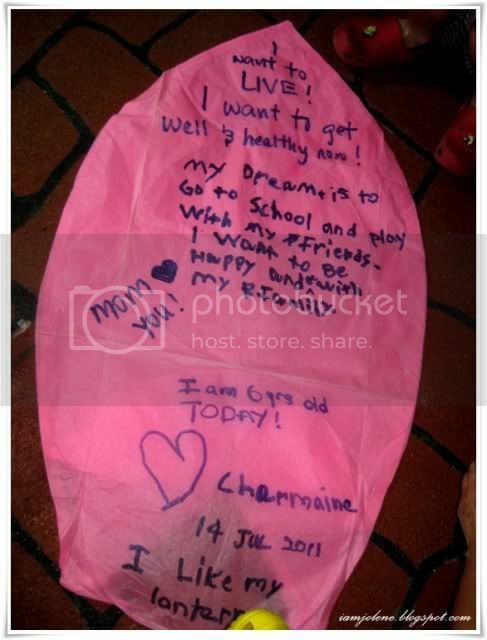 Hence we got Charmaine to write her wishes again on the pink lantern since her wishes were the same as mommy's. 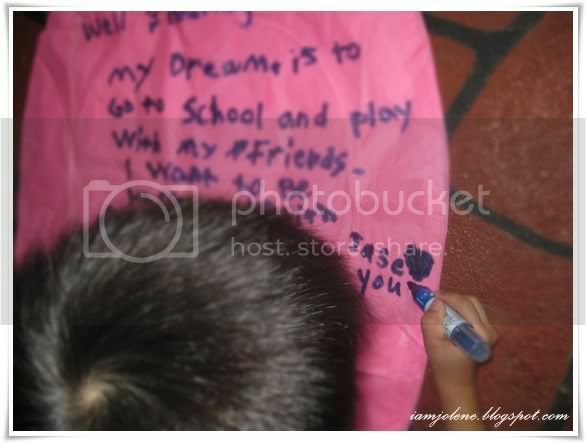 Jase added his little note to Charmaine on her lantern. 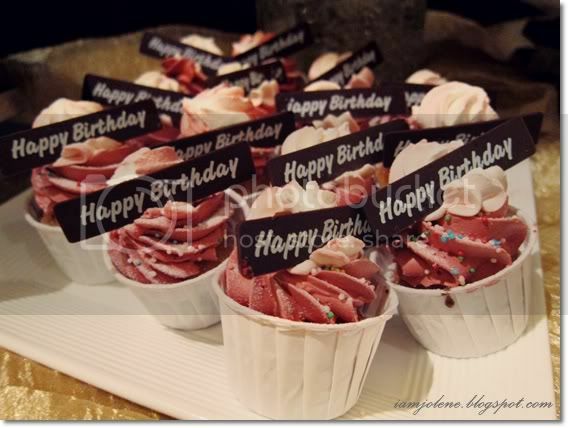 After all the wishes were written down, the adults started lighting up the piece of wax provided. The kids could not understand what we were doing and we had to explain to them the concept of how hot air rises to fill the lanterns and how the lanterns would bring their wishes up into the sky to be granted. Finally, the kids knew what they were doing and got excited. The title up there isn't apt. 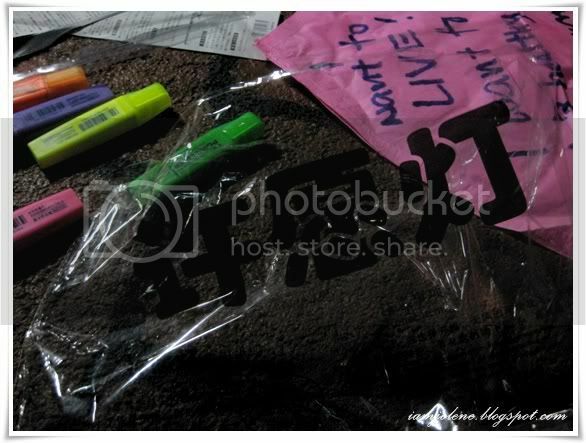 It should be attempting to light up the wish lantern. Fortunately, we brought the right kind of lighters. Part 2 depicts our success in releasing the lantern. After a long time trying to get the "fuel" to light, we finally succeeded in releasing the green wish lantern into the sky. "Make the wish come true please" uttered by Charmaine at 0:28 brought a little wrench in my heart whenever I watch this after she is gone. 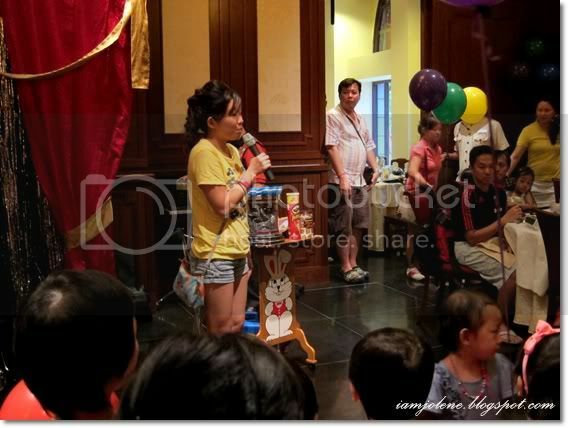 In this video, Cyn mommy was asking Charmaine what exactly she enjoyed about the whole wish lantern experience. She answered that it was mainly the drawing. 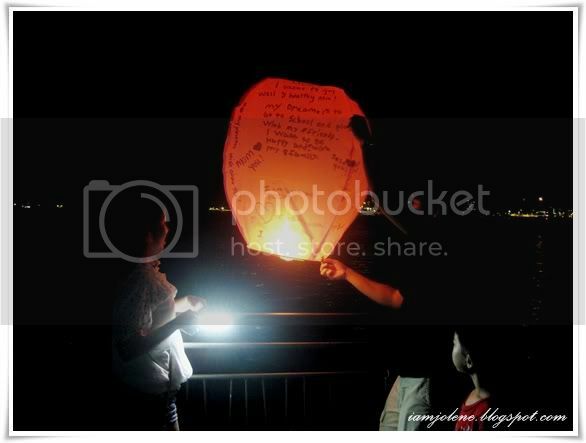 As a finale, we released Charmaine's lantern. 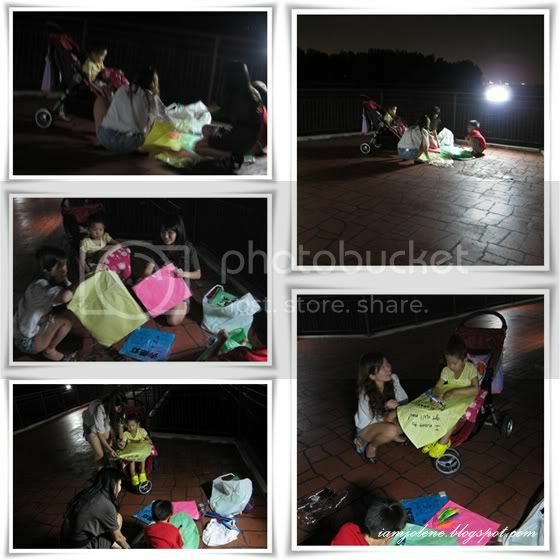 Charmaine was undoubtedly very tired even as she lay on her stroller and watch the lantern slowly disappear among the stars. Nonetheless we could all tell that she was really happy for that whole moment of seeing her lantern taking along her wishes with it. 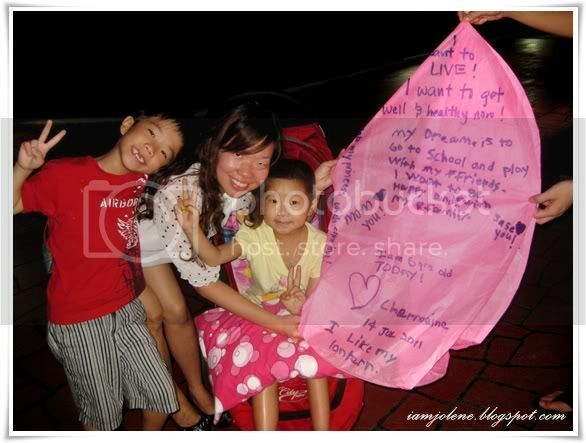 In this video, we released Charmaine's pink lantern. The video is about 5 minutes long with majority of it capturing the gradual floating of lantern up into the sky. PS: To clarify what Char said, I did not "cancel" my work. lol... Those days were either my off days or else then I took time off or leave. Hope you kids enjoyed yourselves experiencing your first releasing of wish lanterns as much as we enjoyed our first in Singapore! Back to updating backdated entries. 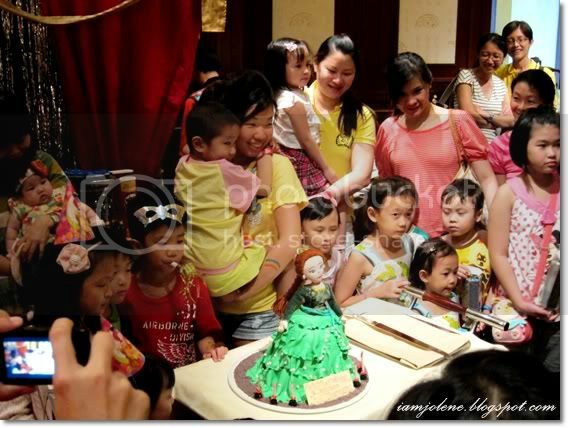 My god daughter Charmaine's 6th birthday party last July was held at none other than Sentosa. 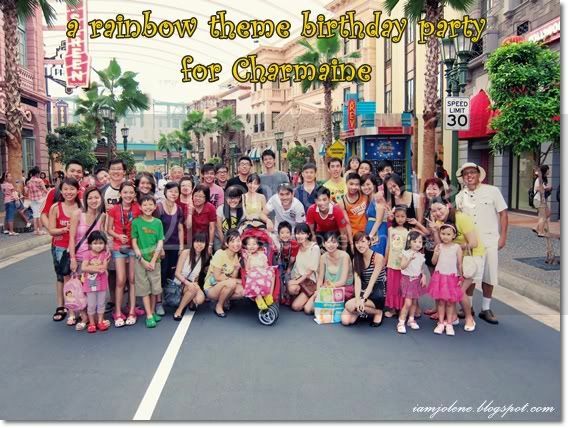 Little Char decreed that it was a rainbow theme and that everyone should come dressed in brightly coloured outfits. This was how the hotel room was decorated when Cyn mommy and the kids first stepped in. Here's Godpa and Godma looking suave with our sunshades on a sweltering sunny Sunday morning. The alliteration up there is purely coincidental. 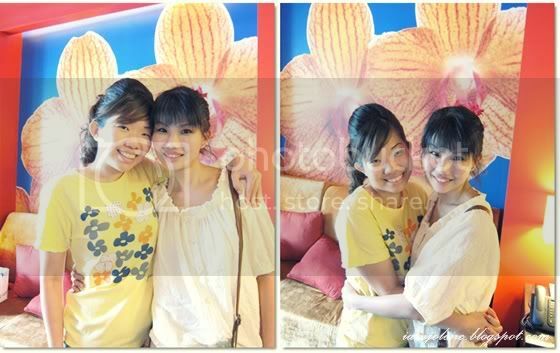 I was clad in a creamy yellow top with nudish pink skorts. To add a more vibrant colour in the otherwise muted shades, I clipped on my beachy hot pink flower clip. Kh decided to be boring and come dressed in white, insisting that there were bright colours on the logo of his polo tee. 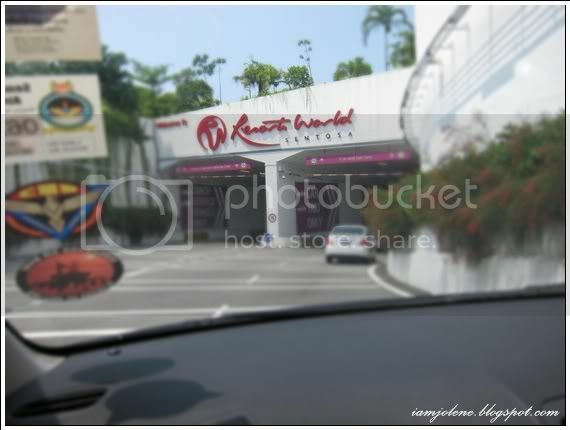 Driving from one end to the other end (thankfully it's the shorter end) of Singapore, we finally reached Sentosa. A zesty combination of orange, red and blue donned the walls and ceilings of the hotel room, creating a vibrant and exuberant atmosphere which was perfect for the rainbow theme. 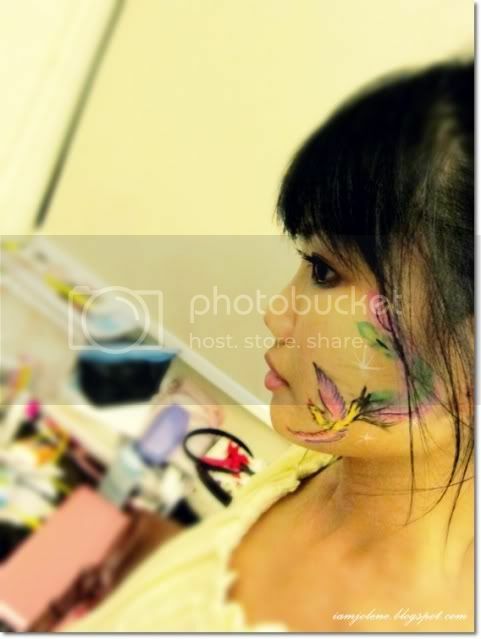 The room was abuzz with face and body painting activities. I was utterly delighted to see the kids just as they were to see us. It is my standard practice to ask the kids for a big bear hug whenever I see them. Jase was so sticky to me that morning and stuck to me like superglue after giving me his version of big bear hug. Char could not really hug me proper as she was in the midst of having her forearm painted. Everyone felt that Jase looked really cool that day. It was the first time that pretty Precious Moments boy had his hair gelled up in spikes. On most occasions, he would have his fringe down like some pretty boy from those Japanese, Korean or Taiwanese boy bands. My dearest friend, Cyn mommy, looked so gorgeous that day with her hair all done up! I've never seen her with her hair professionally styled since Charmaine's diagnosis. This babe needs to learn to love herself! I was surprised to see a man doing the face painting. 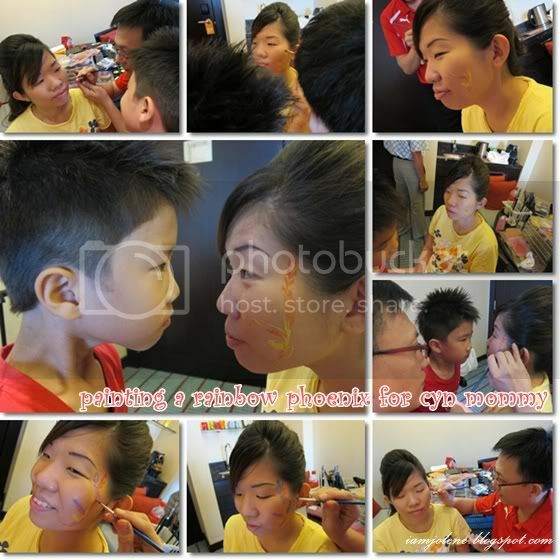 On usual days, he takes on the role of an engineer but on weekends, he would help his wife with face and body painting. We were absolutely awed by his scientific and artistic sides. Don't you love the colours in the box here? 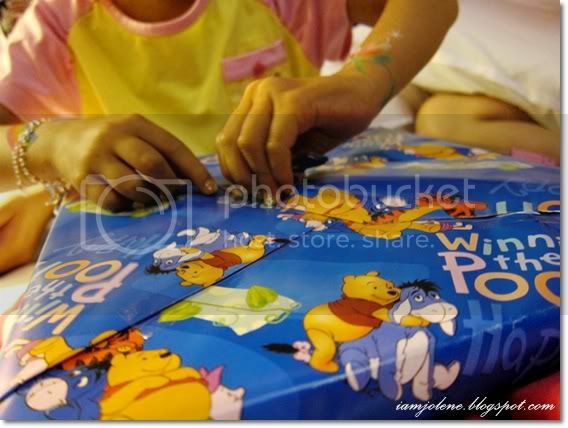 The paint they use are of good quality and hypo-allergenic which is suitable for children. My skin can be quite sensitive and it did not even itch at the end of the day and the days after that even with a huge phoenix painted on. The kids thoroughly enjoyed looking at the painting process. Well, the adults too! Char suggested for Cyn mommy to have a phoenix painted somewhere. 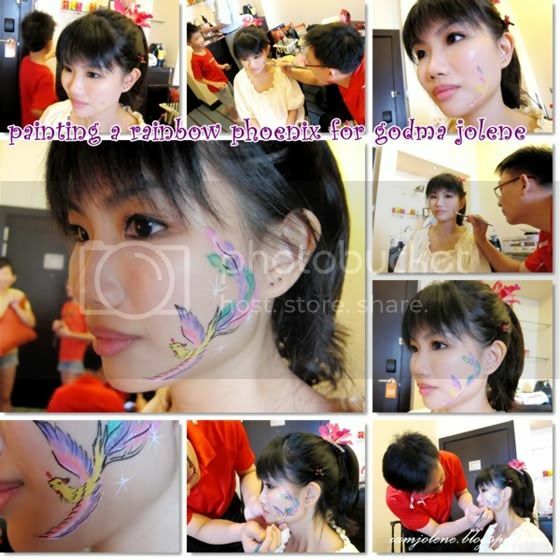 Cyn and I unanimously ageed that having a phoenix on the face was cool. Char wasn't quite sure about that idea as like most 6 year-old girls, she was a vain little girl who was concerned about having anything painted on her face. 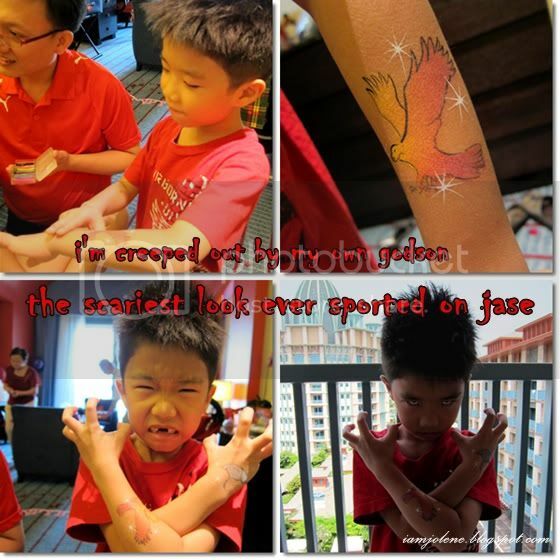 However, after seeing both mommy and godma's phoenix, she decided to have one on her face too! Cyn's phoenix was mainly yellow and orange. Throughout the whole process, Jase was so cheeky as he was trying to make cyn talk well knowing that she could neither move nor open her mouth to scold him. My phoenix was mainly purple and green. Guess who disturbed me while I sat there like a statue? Nope, not Jase but the annoying hubby. He even took a video and said it was so rare to see me so quiet. While Char was resolute on her decision, Jase was indecisive about whether he should choose a shark or an eagle. 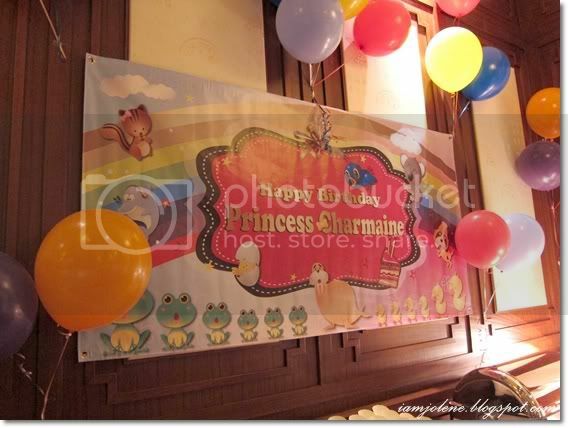 Charmaine had got all things sweet like rainbow and butterfly while Jase went for cool eagle. Many more guests arrived in the room including my favourite cancer survivor boy with that winsome smile whom I got to know of last year. They all had their faces and bodies painted as well. After that, Godpa and Godma brought Jase to Universal Studios first. Godpa and Godma are such adventurous people who on normal occasions would sit all kinds of rides. Hence, it was quite a bore bringing the very cowardly Jase around the theme park. Godpa: Jase, let's sit the Mummy Ride! 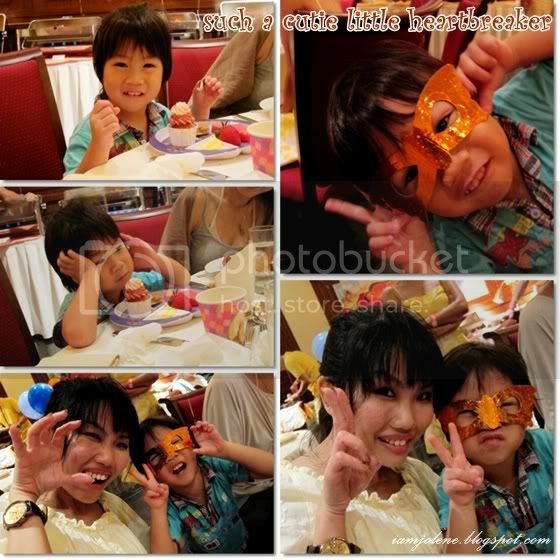 Godma: We sit mei mei's favourite roller coaster ok? Jase: Um, no thanks, That's too fast. Godpa and Godma: Haiyo Jase! You are so boring! True enough, he did not sit on any ride at all and we were almost bored to tears. Besides all the invited friends and guests to the party, we bumped into a few of our friends. 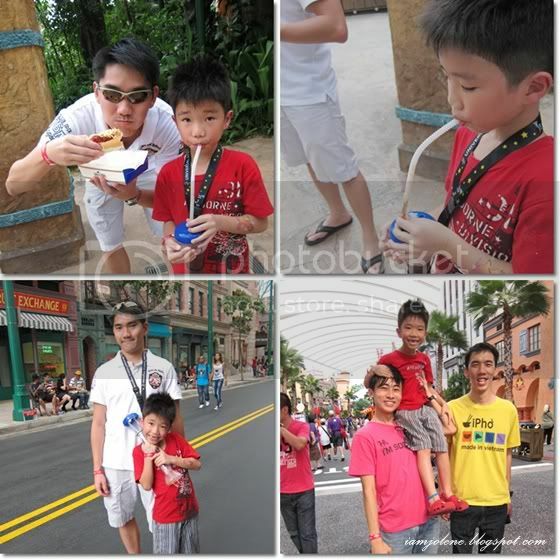 It was such a coincidence and it did feel like the whole of Singapore was gathered at Universal Studios that day. Finally, all the guests arrived and we were ready for the party but not before we took a group shot. Look at how colourful the whole entourage was! There were so many cameras passed to our poor photographer-friend, Charles that he was fumbling with all of them. Many other patrons of the theme park also took out their cameras to snap us. 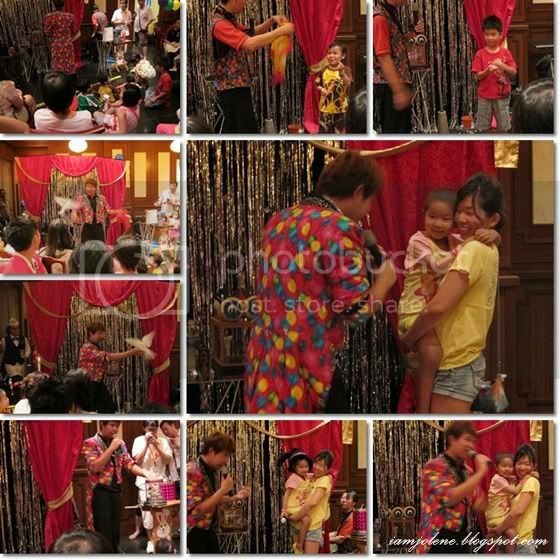 Some of them recognized Charmaine as they were pointing excitedly and talking among themselves. 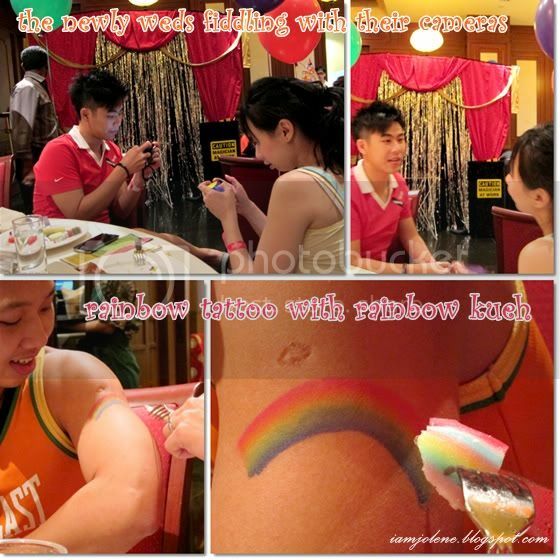 The very colourful rainbow themed decoration surprisingly paired well with the dark wooden panels of the room. 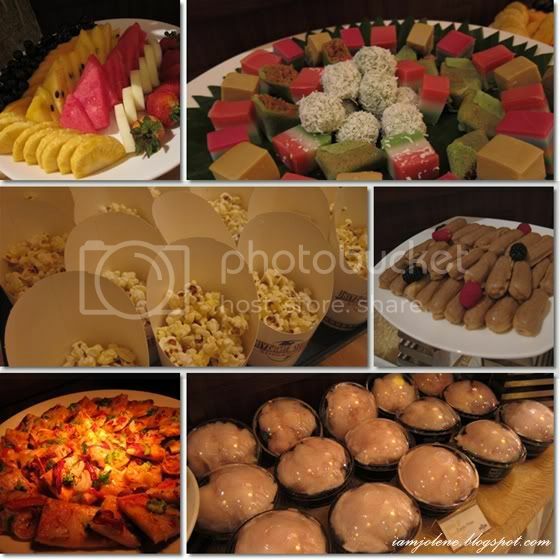 Even the food looked so colourful and enticing! My absolutely favourite was this (not to eat but for photography purpose). Here was what I had. Apparently there were plates for adults and kids but I did not know. 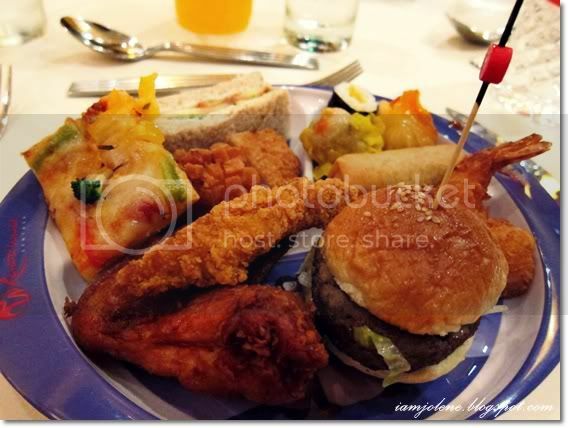 Hence, when I returned to my seat with the Madagascar plate, kh, Charlene and Josh laughed at me. Charmaine was already feeling very tired and was in pain though she insisted she was fine whenever we asked her if she was feeling alright. 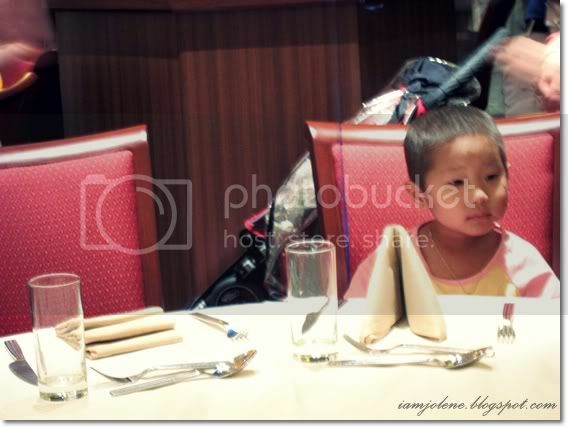 She could even smile so naturally when she knew I was taking a picture of her from the next table. 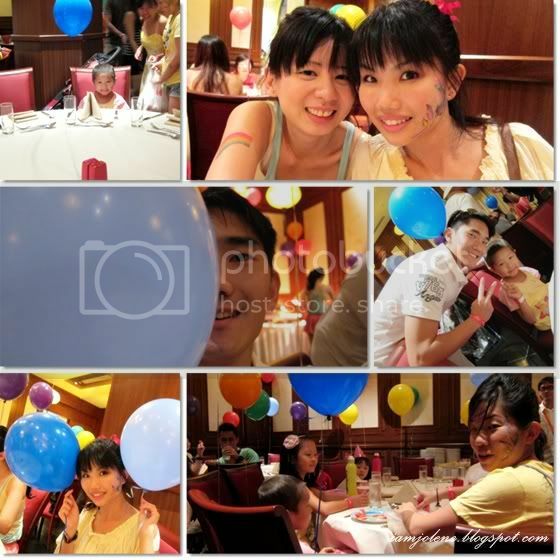 I really love how the colourful balloons did not look out of place in an otherwise posh setting. Next, I'm going to introduce my newest favourite boy. He's the son of Cyn's good friend, Josse, who became our friend too. He's such a handsome little cutie and really intelligent too. I love him to bits! He was really very cheeky. He would purposely make funny face when he knew I was going to snap a picture of him, answer "no" whenever I asked if I could have a picture with him, only to have him coming to me with his mask and hinting me to take a picture for him and with him. So cute! 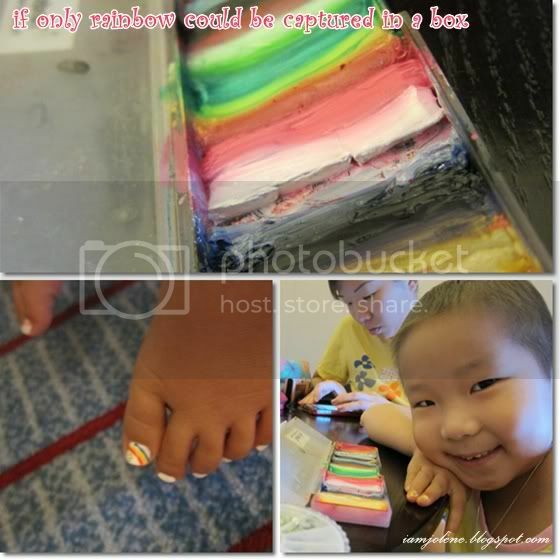 Above, you see how lame we could get finding similarities with WK's rainbow and the Nine Layer cake. It was time for the cake cutting. The cake was in the form of Fiona from Shrek. Being a valedictorian during her secondary school days, I was fast getting accustomed to Cyn's wonderfully impromptu and touching speeches. 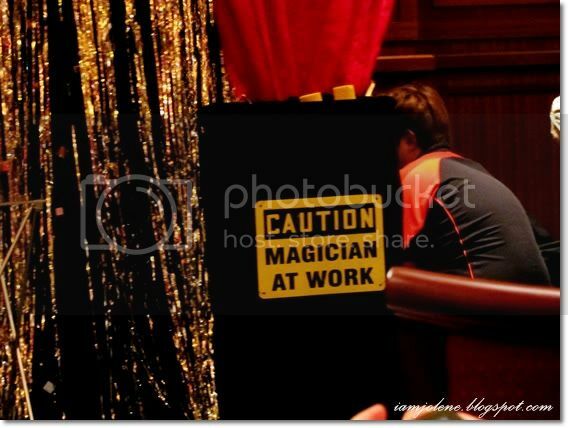 Next, the kids (and the adults) were treated to some magic performance. 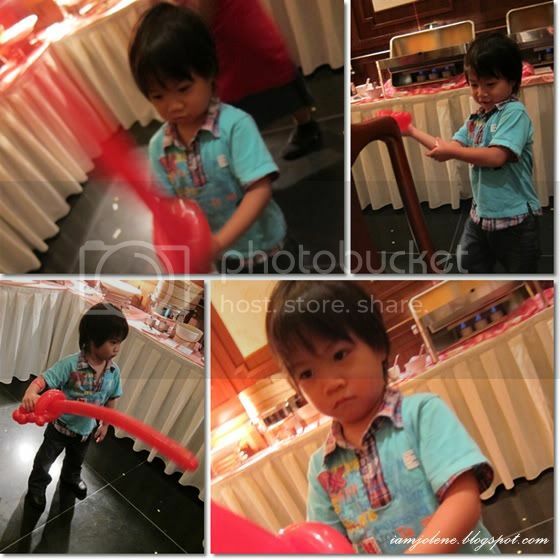 My cutie boy showed some mean fighting moves with his dubious balloon sword. 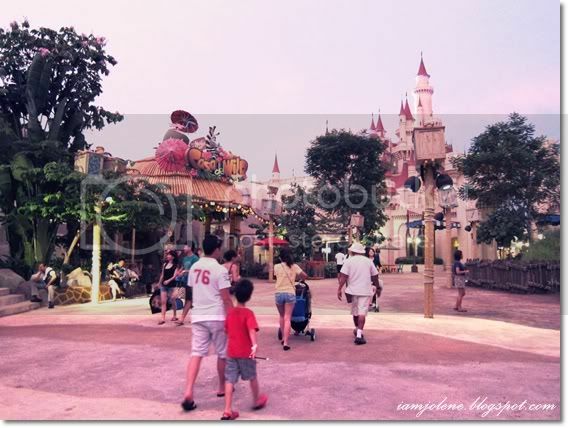 After dinner, Cyn, the kids, kh and I had a guide to bring us around USS. This enabled us to skip the queue. Jase's favourite ride seem to be the Dino Soarin ride. After my third time visiting USS, I finally got to experience the Battlestar Galactica ride. It wasn't opened the first time I went there and it was closed for maintenance/ safety issues the second time I was there during a company's event. Imagine how I leapt when I knew that I could finally experience the ride that evening! Alas, there was a techincal fault while we were queuing for the "Cylon" side and an announcement was made to urge patrons to take the "Human" ride instead. Though it was fun, Cyn, kh and I felt that the thrill wasn't up to our expectations. Of course Charmaine would not miss out her favourite Enchanted Airways roller coaster ride. 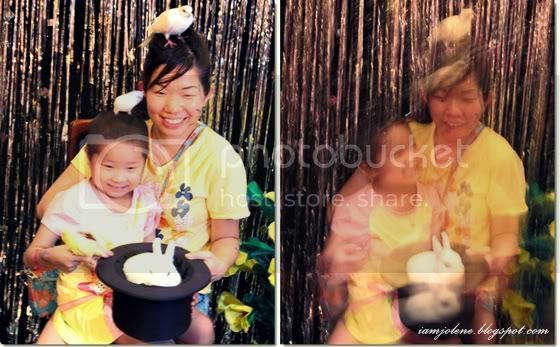 I dare say that in her little mind, USS or even Sentosa is synonymous to Enchanted Airways roller coaster. After one round, Charmaine was exhausted and we decided to call it a day. 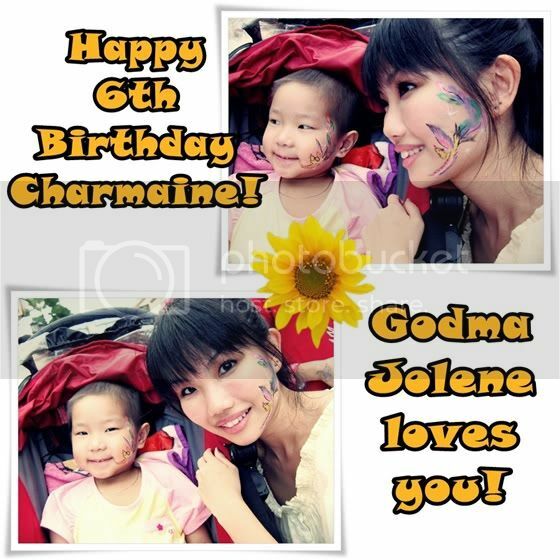 Charmaine was a very determined girl with one of the strongest spirit I've ever known in a little child. Even when she was in pain, she would grit her teeth and plod on as long as she was doing something which made her happy. Hence we knew how painful and tiring it was for her when she did not want to go for her second round of roller coaster ride. Back in the hotel room, it was time to open presents! I got this charm bracelet for Charchar as her favourite doctor, Dr Aung Le Le has a charm bracelet too. Ever since she saw Dr Aung's bracelet, she grew an instant liking for charm bracelets. I was so glad I chose the pram and the bag charms because Charmaine simply loved them! She said that the bag was for cyn mummy and her to go shopping and she would put baby in the pram. I didn't know if she imagined a little baby or did she really mean herself. 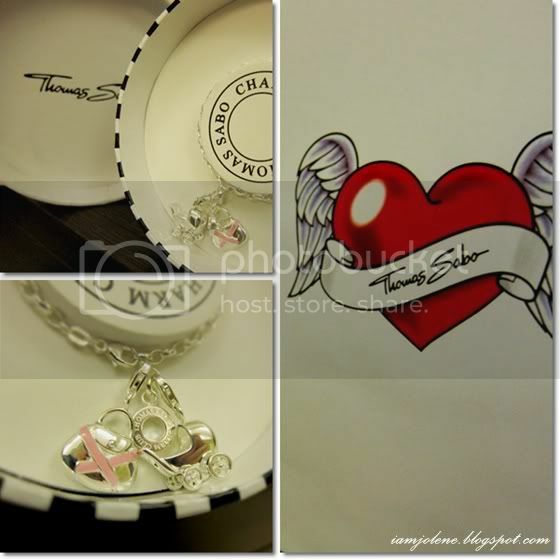 The bag charm would have parts of its proceeds going to the breast cancer foundation and I felt that it was great to be doing a good deed while engaging in consumerism. Charmaine wore the bracelet every single day and she has part of mummy and part of godma close to her heart up in heaven. I can't help but beam whenever I see the close bond between kh and char. He tends to bond very well with little girls though he keeps talking about our future kids as "our sons". Some people did not forget Jase too. The siblings of cancer children are often neglected and it was really nice whenever people remembered to include Jase. Jase had been a really wonderful brother to char and a mature and understanding son to cyn. He really grew up a little too fast during his formative period of 5--7 years old. He was trying out a magic tricks set and kh was teaching him a trick or two. He mastered the rope trick so quickly and adeptly that even Cyn mommy and I was baffled by how the trick worked. 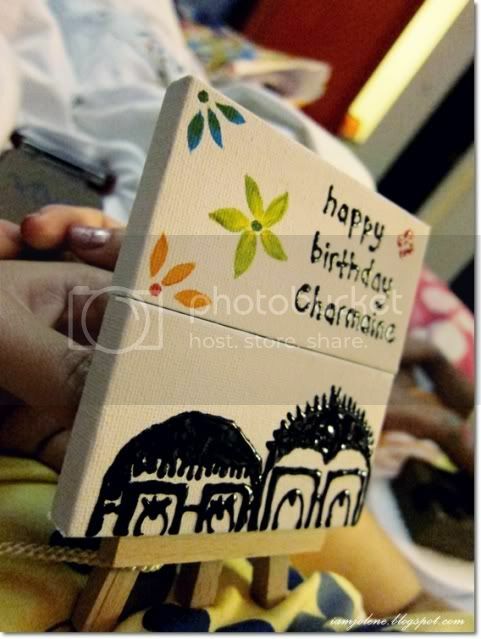 A really cute handmade gift from Charles and his fiance. The cartoon boy and girl look so much like them! Godpa reading with char char. So sweet! Cyn, kh and I chatted way into the wee hours after the kids had fallen asleep. Looking at char char sleeping soundly while waking up intermittently amidst the pain, I can't help but feel my heart wrenching. By the end of the night, my phoenix faded a little though I must say the pigment really stayed put despite feeling oily and sweaty. Nevertheless, it wiped off so easily with gentle make up remover too. I'm amazed! I could really tell the difference between good quality face paints and cheapo ones. 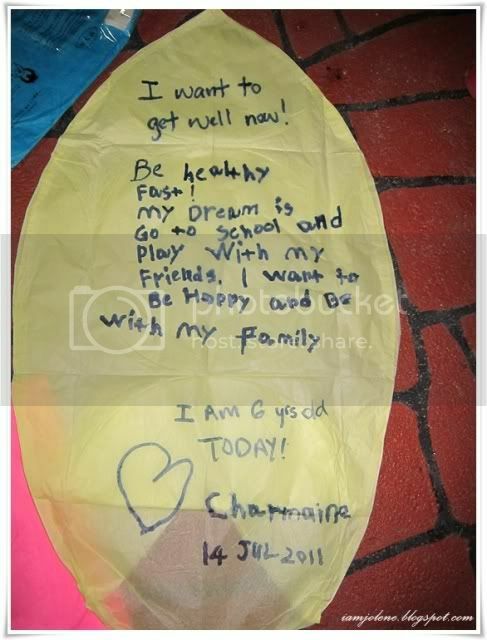 Next up would be a post on releasing wish lanterns on Charmaine's actual birthday.